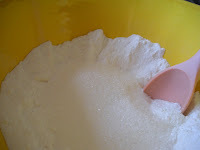 la vie DIY: DIY all natural dishwashing detergent... did i mention it's super cheap? 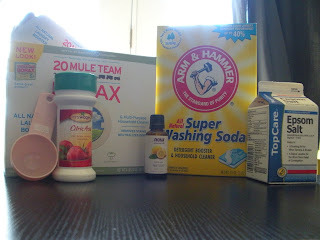 DIY all natural dishwashing detergent... did i mention it's super cheap? I know that mondays are notoriously awful for 90% of the population, but today is so fun! I woke up early, read a bit and headed out to meet a friend for a morning of French and ballet. In my book- that is perfection. And THEN- I went to Horrocks, and found that they are indeed stocking my favorite baked goods again. Are any of you out there fans of Rise 'n Roll Bakery? Maybe if you're from Indiana you've heard of it. 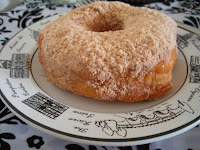 It's an Amish bakery that makes the.best.donuts in the world. the best. I promise. Recently, they stopped coming to Lansing because it was too much trouble to make the weekly deliveries. Do you wonder why? That would be because they DEFINITELY use a buggy! I promise. I've seen it. Anyway, there was such an uproar that they're back! I'm not too proud to admit that I both spoke with a manager and wrote e-mails about the situation. Victory is mine. I'm currently devouring one of their powdered cinnamon donuts between clicks on my keyboard. bliss. And NOW it's time for another DIY natural product tutorial. If you made last week's laundry detergent then you should have nearly everything you need for this project. And hey, this project is EVEN EASIER! The only additional ingredients you need are citric acid, which can be found in most grocery stores right now (canning section) and epsom salt. Literally, put everything into a bowl and stir until well combined. Transfer it to a container of your choice (I usually get really cute ones from Marshalls/Homegoods/T.J.Maxx for $3 and then label them with a Sharpie paint pen). Use 1 tablespoon per load... you're done! 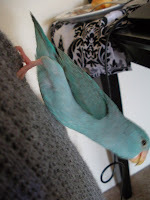 So... go make it :) Personally, I have GOT to clean the kitchen and spend some time with Odette. She's hanging upside down from my leg warmers (no... definitely haven't changed out of my ballet clothes yet) and attacking me. She needs love. Annd, of course... I really need to decide what color I want to paint the chair for tomorrow's blog. Time is ticking! Hi! I've been wanting to try this for awhile, but I can't find citric acid anywhere! I bought borax, washing soda, and epsom salt a few weeks ago. What do you think would happen if I left the citric acid out? I probably need it, huh? Or do you know of something I could substitute for citric acid that'd be easier for me to find?